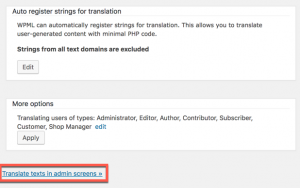 WPML’s String Translation module is part of the Multilingual CMS account type. To enable it, you first need to download and install it from your WPML.org account, under the Downloads section. 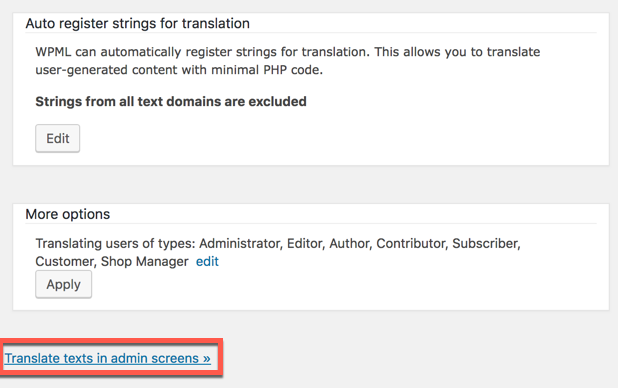 Then, go to the WPML -> String Translation page in your site. Be sure to click on translation is complete after you translate. Incomplete translations will not appear on the site. When you no longer use a certain theme or a plugin you might wish to remove the strings associated with it. Simply select the strings you want to remove and click Delete selected strings. You can set the source language of specific strings or all strings that belong to a domain (context). To change the language of specific strings, select them and click on the new Change language of selected strings button. Then, select the new language. You can also change the language of entire contexts. This is useful when you get a theme or a plugin, that’s coded in a language other than English. Click on the new link, at the top of the String Translation page, Language of domains. Then, choose the new language. The dialog will show you a table of the strings in that domain. You can choose the new language and also make it the default language for new strings that will be added to that domain. This option helps you identify where strings are used on public pages in the site. When enabled, WPML will keep record of the PHP source and pages that display each string. This feature can help understand the correct context of strings and how they should be translated. Enable or disable the tracking for where strings appear on public pages. Click on the icons to see where the string appears in the code or on a public page. Static operation, without any additional server load. Dynamic operation, intended for site development, which loads the server. Enable the Track where strings appear on the site option. WPML uses static code analysis to locate strings that require translation in the theme and plugins. In some cases, the static code-scan cannot reliably find all strings. This often happens when strings are generated dynamically using code (not really static/”hard-coded”). By enabling auto-registration, WPML will register strings that need translation at display-time. The conservative option is to register strings when logged in as an administrator. This means that when a logged-in admin browses the site, WPML registers for translation any strings that are displayed. This operation may increase a number of database queries while strings are registering for translation. You can import translations from other sources and export your current translations using .po files. If you choose to export strings without their translations, the file extension will be .pot (Portable Object Template). If you choose to include translations, the extension would be .po. When you import translations, you must choose the language to import to. 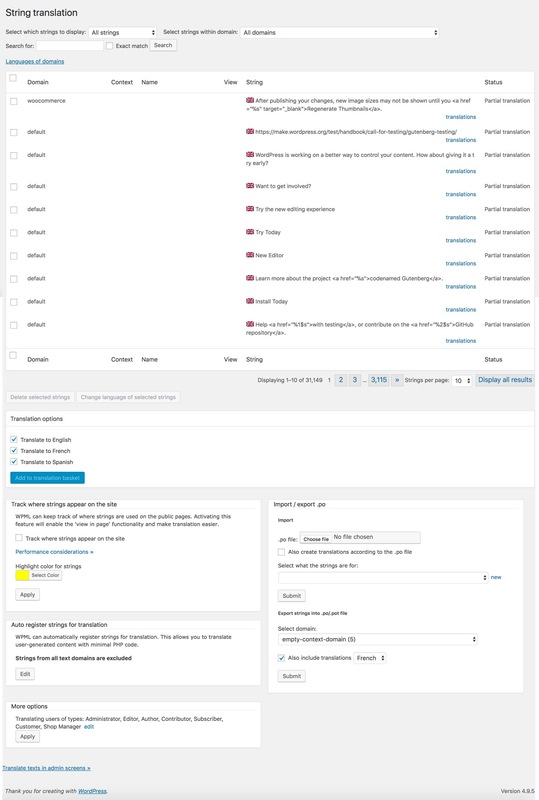 Many themes and plugins store texts in the wp_options table. This is also the case with Widgets. Widgets also store their setting fields in the wp-options table. You can tell WPML to register these strings to translation. To do this, click on Translate texts in admin screens. This will open a dialog showing the strings that WPML finds in your site. The list will often be a tree, which you can expand and collapse. Developers note: Theme and plugin authors are encouraged to include a language configuration file in their code, which tells WPML which strings from the wp_options table to register for translation. This can save a lot of time for end-users configuring multilingual sites. You can easily export the strings you want by using the “Export selected strings as a WPML config file that can be added to themes or plugins ” button (see image above). If your option includes a lot of sub-options, you can use the asterisk (*) as a wildcard character in your configuration file. You can find more information and examples on our page about creating language configuration files.